I'm happy to be back sharing our Adventure to Colorado with you after taking last week off to do a monthly adventure post. If your not a regular reader of mine, you may not know that my husband and I took a vacation to Colorado in late May, and I have been doing weekly travel posts about it. If you missed those posts, and want to start from the beginning, go HERE. This week's travel post is a continuation of last week's post of Rocky Mountain National Park. If you missed that post, you can catch up HERE. In my last post, I shared about our hike up to Alberta Falls, this week's post is about mountain lakes and Trail Ridge Drive. First, I have an embarrassing fact to admit, but you must remember that I am a mid-west girl who never saw a mountain in her life before my first vacation to North Carolina years ago, so have pity on me. Here we go: I never knew there were lakes in mountains before this trip. There, I admitted it. I mean, mountains are tall, how could there be lakes up in such high elevations, wouldn't the water just drain down? But, there are. And they are beautiful. Because they are unpolluted by boaters and city run-offs, they are serene and crystal clear and the mountain reflections off the water is gorgeous! after hiking back down the Alberta Falls trail, we went to our car and ate a picnic lunch. Then we decided to take a short hike to Bear Lake. This trail is described as 'Easy' because it is literally only a few feet away from the parking lot, and it is a beautiful path that goes all around the lake. One Trip Advisor reviewer described it more of a 'Stroll' than a 'Hike', because it is so easy. However, she wasn't there in May like I was. Most of the trail then was blocked by snow and ice, and there was even a warning sign about it being slippery and dangerous on the south side. Because of that, we just walked to the lake to see it, and then turned around and walked back rather than attempting to walk around the entire lake. The picture above is my husband and I standing in front of Bear Lake. Seeing our first mountain lake was an amazing experience for us. We just couldn't believe how beautiful and serene it was. Growing up in Milwaukee, I'm so used to seeing lakes and rivers filled with boaters and/or pollution, that to see such a tranquil, clear body of water was astonishing to me. 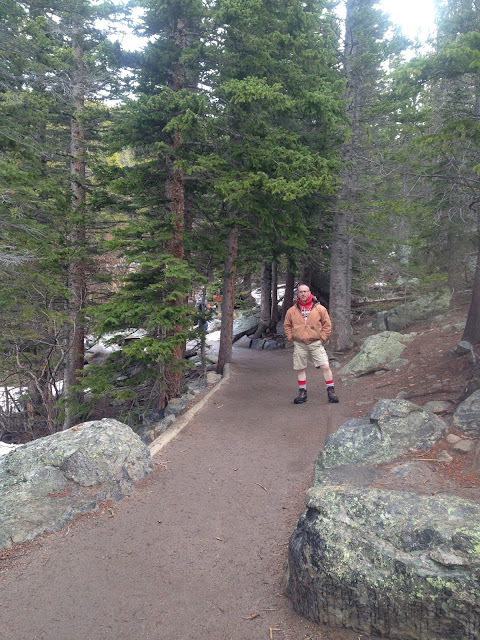 Below is a picture of my husband standing on a part of the trail that isn't covered with snow and ice. It would be the perfect trail to walk for the elderly or disabled, or young families with small children. After we saw Bear Lake, we decided to take the mountain lake trail that would take us to three more lakes: Nymph Lake, Dream Lake and Emerald Lake. The hike to Nymph Lake from Bear Lake is described as 'Fairly Easy'. It is 0.5 miles one way with an elevation gain of 225 feet. Keep in mind, at Bear Lake we're already at an elevation of 9475 feet, so the weather fluctuates constantly. One minute the skies are crystal clear and the sun is out, the next minute your caught up in a rain cloud. This hike had some of the most beautiful views I had ever seen in my life. 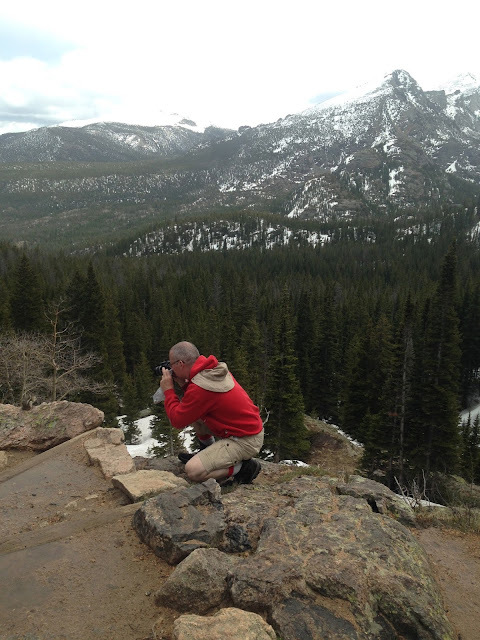 Below is my husband risking his life to take a picture of a chipmunk. He insisted he was safe and that there was a ledge below him. I got so nervous I couldn't even watch, so I just walked ahead. We found an large overturned tree on the trail that was left alone so long the entire thing, including it's root system became petrified. It was so gorgeous! I would have loved to taken a chunk home with me! Notice how wet I am in the picture above? We just got soaked because we got caught in a cloud and got pelleted with ice. I actually hate this picture because I look so fat with all the layers, and layers of clothing I had on….and I still got soaking wet to the bone. I literally had to peel my skinny jeans off when I got back to our hotel. The picture below is a close up of the petrified wood with my hand in the picture so you can get an idea of the scale. Isn't the wood absolutely gorgeous? 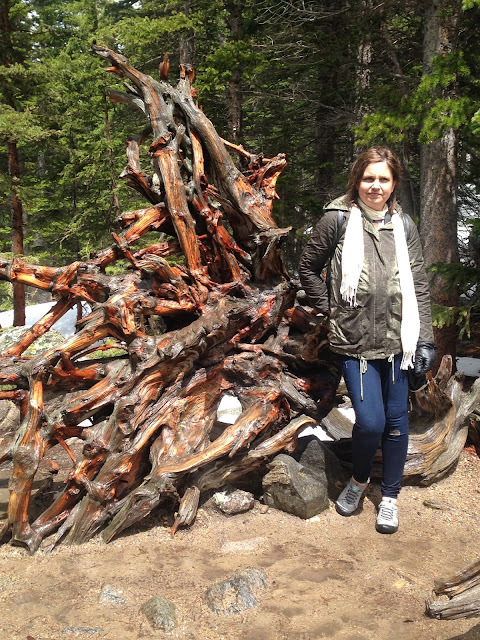 I don't understand the process of petrified wood…it's simply another one of nature's miracles to me. When we were admiring this beautiful artwork of nature, a hiker walked by and jokingly said "Wouldn't you like to know who the artist is?" I laughed and said "I do know Him! God!" Nymph Lake is more serene and gorgeous than Bear Lake because a lot of park visitors don't want to make the hike up here in the snow and ice in May. Bear Lake in contrast, is quite popular and very crowded. It was so peaceful here, and the sun was out so the reflections in the water were breath-taking. We met a lot of these birds in the mountains. I've never seen one before. They are called Scrub-Jays and are very similar in build to the Blue Jays we have in Wisconsin, but they are much friendlier. You can get really close to one to take their picture. They actually look for hikers, especially if they are eating, and they will come to you for crumbs, or wait till you leave and clean up your crumbs. After some time admiring Nymph Lake and breaking for a snack and playtime with the Scrub Jays, we headed up to Dream Lake. It is described as 'Moderate', with a one way distance of 0.6 miles from Nymph Lake, and another 200 foot elevation gain. We discovered a large rock formation on this trail that we could climb up on and get some gorgeous shots of Nymph Lake below. 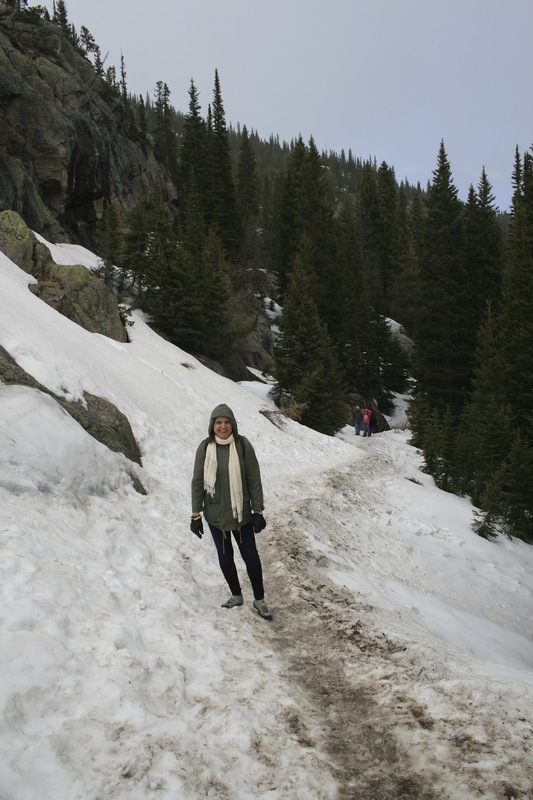 Due to the higher elevations, this trail got fairly steep at times and was completely covered in snow. This was probably the scariest part of the hike, for I was afraid if I slipped I'd roll right down the mountain! 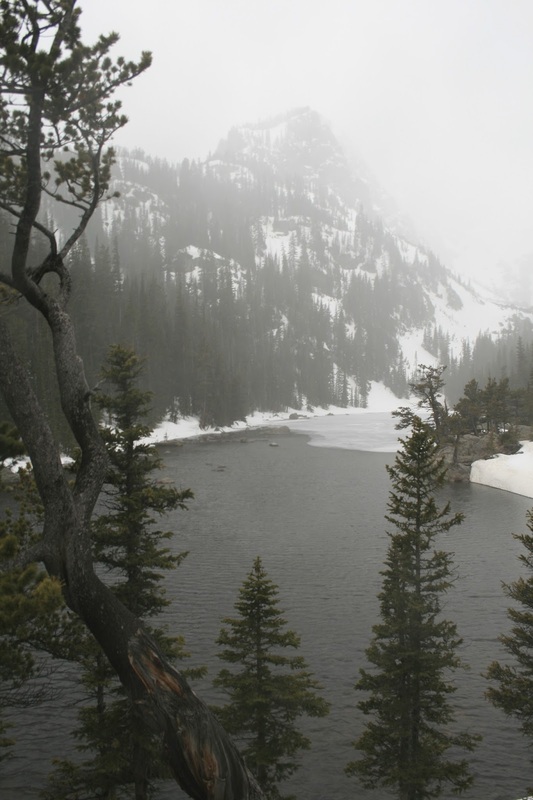 When we got to Dream Lake, we got caught up in a cloud and were pelleted in ice. And boy did it hurt! We hid for cover under some scraggly pines, which helped. There were only a few other hikers with us, so we tried to wait out the storm with them. After ten minutes of freezing, and being pelleted by the ice, most of the hikers decided to head back down the mountain. 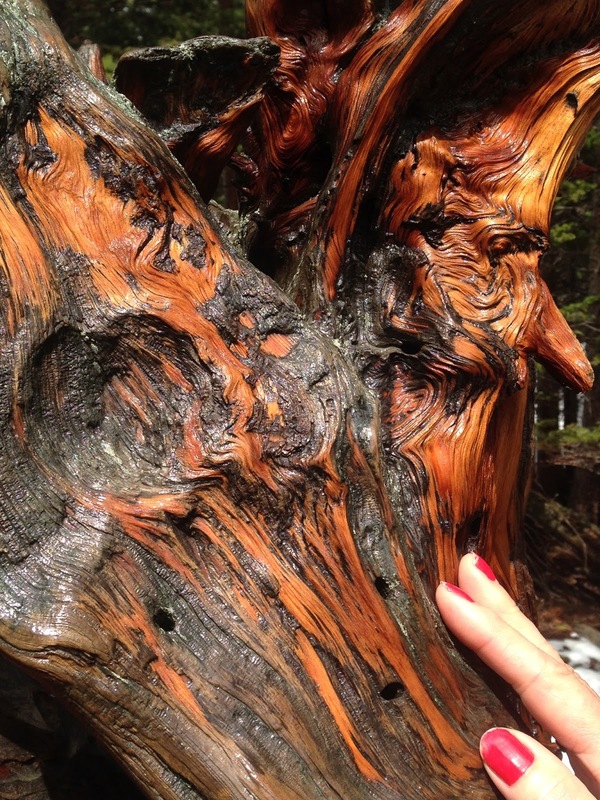 One group of young hikers still decided to keep going up to Emerald Lake. I looked at my husband and we didn't know what to do. On the one hand we thought "We may never get here again, we have to keep going", but on the other hand I was cold, wet, and in severe pain from the ice pellets. We were also worried about our DSLR camera which was getting soaking wet. So we made the sad decision to turn around and go back. Because of the cloud cover and ice, we could only get this kind of picture of Dream Lake. Which, was another reason we didn't go on to Emerald Lake because we couldn't see much anyway. I can only imagine what this lake would look like when the sun was out! My poor, cold, wet husband! Once we got down about a half mile from Dream Lake, the sun came back out again and we were more comfortable for the duration of our hike. When we got back to our car however, I removed as much of my soaking wet clothes as possible, and put on dry things. We then decided that we had enough hiking for one day and decided to take a scenic drive. 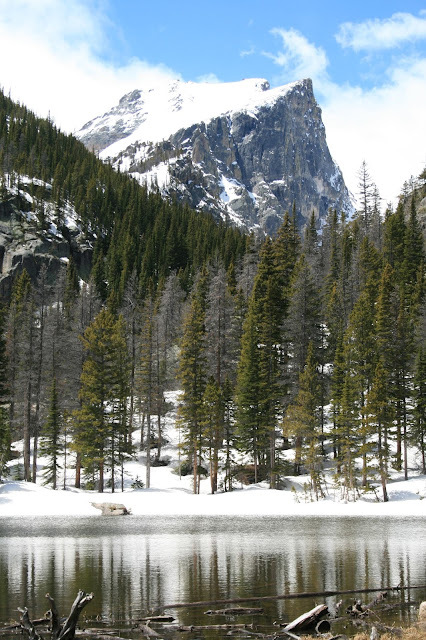 Rocky Mountain National Park has the highest paved roads of any National Park in the United States. 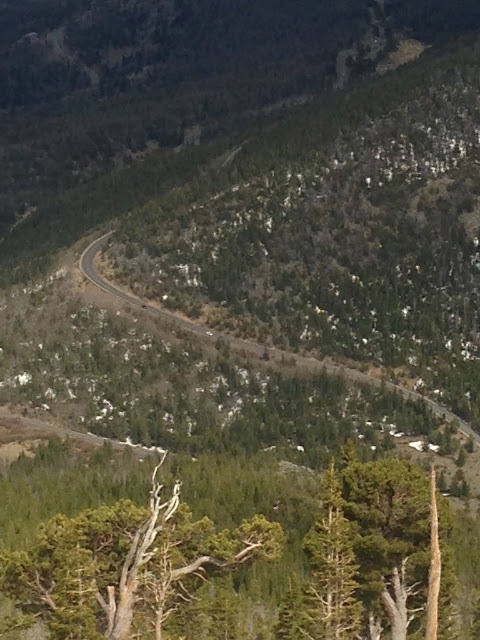 The most popular road is Trail Ridge Road. This road crests at 12,183 feet. Now, as much as I wanted to see the views, after my stressful experience on The White Mountain Auto Tour, I was absolutely terrified to drive on any mountain road again and insisted to my husband we find a different scenic road. 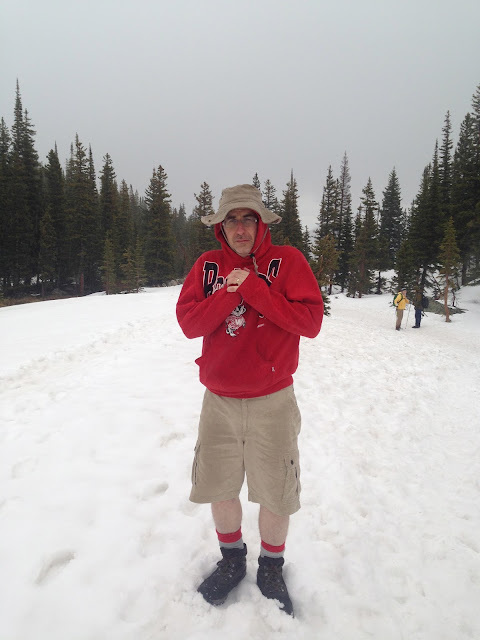 He was pretty determined to go up Trail Ridge Road and promised me if it got too dangerous we would turn around. So I reluctantly agreed and we started the drive up. I wish I could say I enjoyed myself, but I was so nervous I could barely breathe. My husband kept telling me to relax, that it was a great road and he was completely in control, and that there was nothing to worry about. He repeatedly said it was no where near as dangerous as the Mount Washington Road was. And although, I agreed with him that it was a far superior road compared to Mount Washington, that previous experience so damaged me psychologically that I have never been able to relax on any mountain road since! There are many look out points where you can pull your car over and see the sights. Whenever I was outside the car looking at the view, I was fine. It was only when I was inside the car that I felt nervous. Some people say it's because I was not the one in control of the car and that if I would have driven it would have been different for me. I understand that, but I was so nervous, I didn't think I could drive. In the pictures above and below you can see the winding roads that takes you up to this view. If your not afraid of heights, the views are gorgeous, and it is so worth the drive! The week we were there the road was partially closed due to snow and they only let us drive up to a certain elevation point. When we got home from our vacation, I read that the entire road opened up in early June. Pictured below shows the place we had to stop our car and turn around. 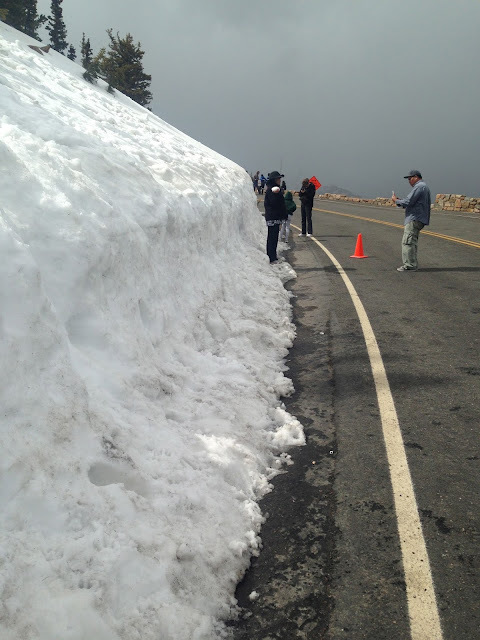 Look at all that snow in late May! We were absolutely thrilled to see this beautiful rainbow from the look out point where the road was closed. How lucky were we? Gorgeous! By now, it was nearing supper time, so we left Rocky Mountain National Park and headed back to our hotel to change out of our wet clothes and freshen up for dinner. We were both absolutely famished and although I wanted to try a new restaurant for dinner, my husband loved the Big Horn Restaurant we were at the night before so much he really wanted to go back. So we did. 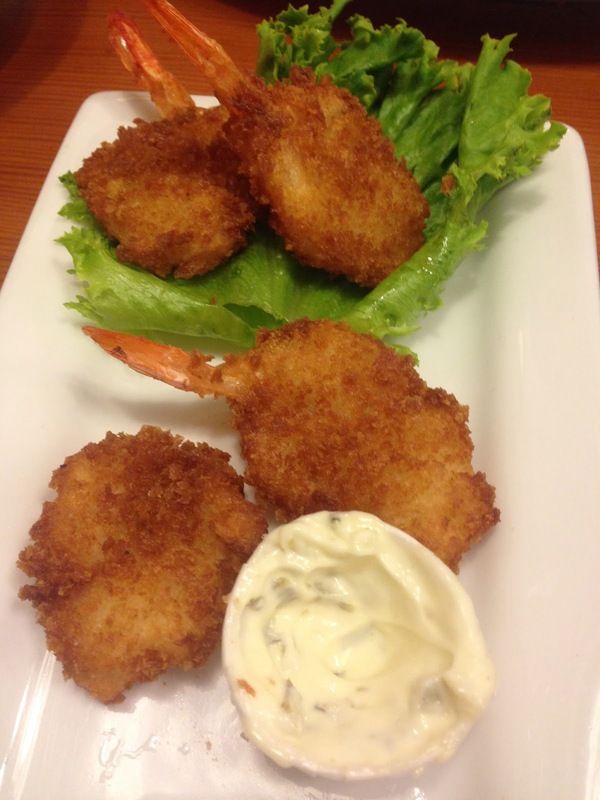 We both wanted to try a new dish, but had trouble deciding, so we each got something different and shared. He got smoked, barbecue chicken, and I got a shrimp platter. After gorging ourselves on the salad bar and potatoes, we couldn't even finish our entrees. Our eyes were definitely bigger than our stomach's! After dinner we drove around town a bit to see if we could spot more elk. We did. Then we headed back to our hotel to soak our aching bodies in the hot tub for awhile. Below is the view from our hotel window. Every hotel in this town can claim to have a mountain view! The next morning we headed to Fort Collins! More on that adventure next week! Such beautiful photos again, Amy! I am so looking forward to our trip later this month! Will be visiting those lakes too, and we're also going to the Garden of Gods (thanks to your last Colorado trip :-). I am terrified of mountain roads too, we went on one in Austria several years ago, and my brother-in-law is a crazy driver, I was terrified. Hopefully this will be better, as we will be going on Trail Ridge Road too,and will have my brother or hubby driving, so it should be better I hope. We are also hoping to be able to drive to the Aspen/Glenwood springs area for a day, there is a lake called Hanging Lake, and it has emerald green water. Looks so beautiful in the photos I saw online. Great trip Amy and what a beautiful pictures you showde us.